Microsurgery Robot Market size was valued at USD 0.7 billion in 2017 and is expected to witness more than 13.9% CAGR from 2018 to 2024. Technological advancements in microsurgery robot allowing effective treatment of various chronic disorders is forecasted to boost market growth during the foreseeable future. Advances such as miniaturization of robotic arms aid to reduce complications and undesirable effects post-surgery will foster business growth. For instance, in October 2017, surgeons from Maastricht University in Netherlands carried out microsurgery for suturing blood vessels of 0.3 mm for treatment of lymphedema. Such advancements will propel microsurgery robot industry growth during the projected timeframe. Increasing number of government and private funding aimed at development of advanced robotic in surgical procedures will potentially spur market growth. As a result, there are numerous surgeries performed in hospitals, clinics and ambulatory surgical centers with robotic assistance. For instance, American Society for Cataract and Refractive Surgery provide research funding for development of surgical robot that can be used for colorectal surgery. High demand for microsurgical robot in healthcare facilities coupled with various funding for advancement of microsurgery robot are set to offer lucrative growth over the forecast timeframe. However, high cost of microsurgery robot will negatively impact market growth. Strict regulations laid by various regulatory bodies and dearth of skilled personnel can potentially restrict industry growth during the upcoming years. Urology surgery segment dominated in 2017, with segmental revenue of USD 140.9 million owing to huge applicability of robot-assisted surgeries in urology disorders. Congenital abnormalities of reproductive organs can be treated efficiently by using microsurgical robots. Complex procedures such as pyeloplasty can be managed effectively by use of robotic assistance that offers greater precision than laparoscopic pyeloplasty. Employment of microsurgery robot helps reducing recovery time along with prevention of blood loss. These benefits will facilitate accelerating demand for microsurgery robot in urology disorders in forthcoming years, thereby augmenting segmental growth. Oncology surgery segment will grow at a momentous rate of 15.7% during the forecast timeframe owing to high pervasiveness of cancer. According to World Health Organization, in 2015, more than 24.6 million people worldwide suffered from cancer. Robotic surgery can be employed for treatment of various cancers such as prostate cancer, colorectal cancer, head and neck cancer. Shorter recovery time and low post-operative complication are few of the advantages offered by robotic-assisted cancer treatment. Such factors will favour segmental growth in recent years. Hospitals and clinics segment held largest revenue share of 50.7% in 2017. The segmental growth is attributable to growing burden of chronic diseases on healthcare industry. Multi-speciality hospitals offer advanced therapeutic solutions to patients, thereby improving patient outcomes. Affordability of hospitals to buy technologically advanced robotic systems and increasing adoption of minimally invasive surgical procedures will increase demand for microsurgery robot in forthcoming period. Ambulatory surgical centers segment will grow with a remarkable rate of 14.5% during the forecast timeframe. High growth rate is credited to cost-effective treatment options provided by ambulatory surgical centers. Reduction in length of stay in ambulatory surgical centers is major factor propelling segmental growth. As there is high adoption rate of surgical robots in ambulatory surgical centers for providing minimal invasive surgery, segmental growth will be tremendous in the future. U.S. microsurgery robot market contributed to the largest revenue of USD 355.1 million in North America in 2017. High per-capita and disposable income will enable patients to opt microsurgical robot for various surgical procedures. According to General Surgery News, in 2015, about 140 thousand robotic general surgeries were performed in U.S. Microsurgical robot is widely used in U.S. due to growing demand for minimally invasive surgical procedures. This will foster regional growth in foreseeable years. India microsurgery robot market is forecasted to grow at a rapid rate of 16.3%, owing to escalating rate of chronic and infectious diseases. Increasing healthcare expenditure, R&D activities and growing per-capita income, leading to introduction of newer technological devices and employment of microsurgery robot will contribute to boost industry growth. Moreover, greater usage of technologically advanced robotic equipment for performing wide-array of surgeries will drive revenue generation in India in coming years. Few of the notable industry players operating in global microsurgery robot market are Auris Health, Intuitive Surgical, Mazor Robotics, Medrobotics, Medtronic, Smith & Nephew, Stryker, Titan medical, Transenterix and Zimmer Biomet. These companies are opting novel product launch, mergers and acquisitions to foster business in microsurgery robot industry. For instance, in December 2017, TransEnterix signed an agreement with Great Belief International Limited for further advancement and distribution of its SurgiBot Robotic System. This agreement will enable company to enter into Chinese market, thereby expanding its geographic outreach and attract large customer base strengthening firm’s market presence. Microsurgery robot is the rapidly growing segment of surgical robot market. 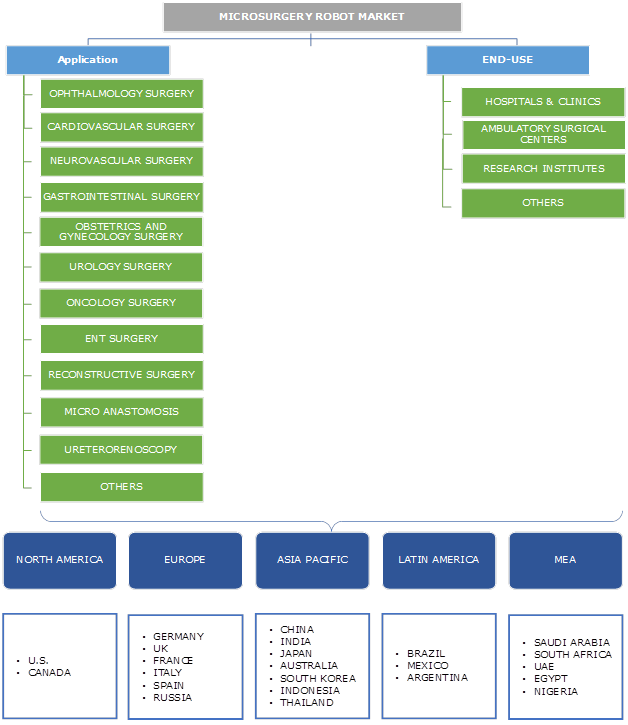 While the market is growing at immense pace in developed countries, developing countries are still dependent on traditional surgical procedures. However, developing countries will witness momentous growth in the future due to growing burden of chronic diseases and rising healthcare spending. Urology surgery is currently the largest segment in industry while oncology surgery and micro anastomosis are amongst the fastest growing application segments. Industry is witnessing large number of new entrants that are engaged in the development of advanced microsurgery robot with miniaturization to generate higher revenue. 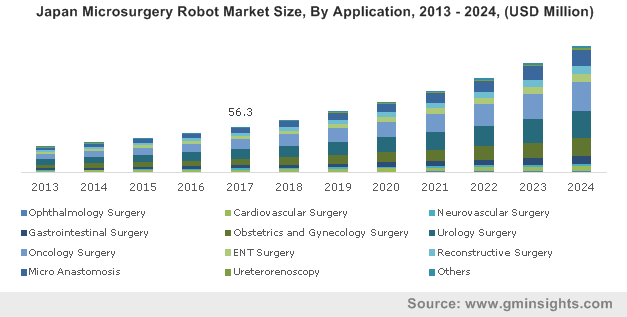 With advancements in existing technologies and rising demand of minimally invasive surgical procedures, microsurgery robot industry will offer promising growth opportunities in near future.